Racism: Can it be Put in the Past? There are people still alive from when segregation once existed. Changing these types of people would almost be impossible because they are fixed to where they originally live and came from. The idea of eliminating racism in society is something they people from a more modern generations would have to live up to. However, there are people from a modern generations that had ancestors that were once a part of slavery or had live in the world of segregation. The elimination of racism in our society is nearly impossible due to our ancestors and the series of events about racism today from TV news to articles online. We can only hope that one group doesn't overpower the others. Since everyone has their own bias, racism isn't going to go away. We can hope for the absence of racism in democracy by just viewing everyone as equal and giving fair share for every race. There are certain programs that is only reserved for blacks, whites, Asians, etc, maybe those types of programs need to be put down. That could be a possibility of how different race view other race and that creates segregation. The solution is to treat all race equally with equal opportunities and equal treatments. How does Learning Racism in Schools Affect Society? American children are the ones that are most vulnerable to racism because high school history classes are teaching topics on racism. It’s the most recent thing, even though racism and segregation existed decades ago. Teachers and parents have been through racism one time or another and that is taught on to the students and children. Racism is non-existent, but it’s exists in our mind. Children are affected by racism once they learn what it is. They may look our their race and other races differently. According to a quote from NoBullying.com, it states “Basically everyone in modern-day America agrees that both bullying and racism in public schools is bad and that it creates and promotes the very same attitudes to others and fosters a poisonous environment for children.” Children learning about racism means that racism is still upon our society and it’s something that cannot be unheard because racism is everywhere psychologically. It’s not necessarily a bad thing, but it’s something that children should learn, stand up to racism, and bringing a positive message about it. An example would be a kid investigating more about racism to find the roots of it and finding a way to prevent racism in society in the kid’s neighborhood or community. Unless the past is erased, the elimination of racism can’t be successful. Unfortunately, that cannot be undone because everyone came from different ancestors and they can be the origin of racism. That brings it into today’s world, where family members talk about the past and the past affects the present. This affects mainly African Americans because they were enslaved in the early 1900s. 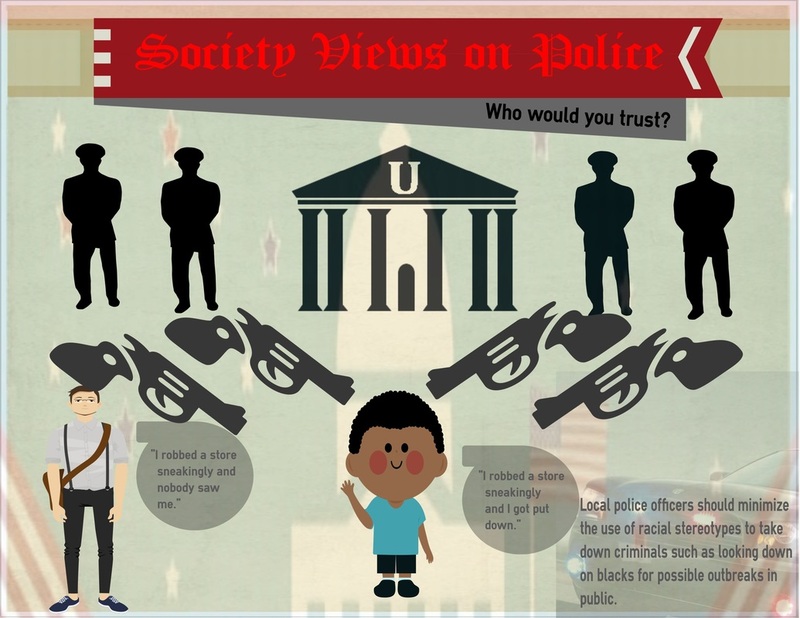 Based on a news article, “Racism continues to poison social relations in America, with black people in particular regarded as an enemy within by police departments and the reactionary system they represent all across the country.” This quote can be depicted everywhere in today’s society such as white cops shooting blacks because of stereotypes of African Americans. This draws back the big question if racism can be eliminated, according to the events going on around America, the possibility of elimination is very scarce. Series of events have been going on for a while such as blacks claiming they don’t have enough privileges because they are black and that whites are claiming the lives of blacks. The most controversial case about race between white and black is the Mike Brown case. Mike Brown was shot and killed by Officer Darren Wilson. There were two sides of the story. One side is saying that Mike Brown made an offensive move towards the police and another side is saying the officer killed Mike Brown because Wilson claimed that Mike Brown to threatened kim him. According to an article from NY Times, “Some witnesses said that Mr. Brown had his hands in the air. Several others said that he did not raise his hands at all or that he raised them briefly, then dropped them and turned toward the officer.” Due to this incident, America has been viewing this as a racial crime, where white police officers are hating on black citizens. The answer whether racism can be eliminated is at no doubt possible. We are carrying the past into the present. Based on what is going on in the news and social medias, racism is getting worse as days goes on. From a YouTube documentary on racism, “Segregation, racial discrimination, and expressions of white supremacy all increased. So did anti-black violence, including lynchings and race riots.” Racism is something that has been in the past but since society has been talking about this, putting the past back to where it belongs seems like it cannot be done. "Please Login OR Register First to Make Recursive Donation." No BullyingExpert Advice On Cyber Bullying School Bullying. 27 May 2014. Web. 20 Jan. 2015. <http://nobullying.com/racism-in-schools/>. "Racism in America: Small Town 1950s Case Study Documentary Film." YouTube. YouTube, 10 June 2012. Web. 20 Jan. 2015. <https://www.youtube.com/watch?v=OClYPCYAf7s>. "â€‹'Racism Continues to Poison America'" - RT Op-Edge. 20 Aug. 2014. Web. 20 Jan. 2015. <http://rt.com/op-edge/181612-racism-continues-poison-america-ferguson/>. "What Happened in Ferguson?" The New York Times. The New York Times, 12 Aug. 2014. Web. 20 Jan. 2015. <http://www.nytimes.com/interactive/2014/08/13/us/ferguson-missouri-town-under-siege-after-police-shooting.html>.